You apply for admission to the program through the Graduate School of Arts and Sciences (GSAS). For general rules and procedures, see the GSAS webpage Applying to GSAS. The following additional rules are in effect for applications to the Mathematics of Finance MA Program (MAFN Program). The MAFN program takes in new students only at the beginning of the Fall semester. There is no admission for the Spring semester. The application deadline for Fall 2019 admission is Friday, May 17, 2019. This is also the deadline for supporting materials. Supporting materials submitted after this deadline will not be accepted. This differes from the general GSAS policy: Supporting Materials. Applicants should have a very good working knowledge of calculus, linear algebra, elementary differential equations, probability, and statistics, and a programming language. Exposure to advanced calculus and mathematical analysis, including measure theory, is desirable but not required. How have you satisfied the mathematics, statistics, and programming prerequisites listed above? We often spend an inordinate amount of time sifting through the application to figure this out. List mathematics, statistics, computer science, and programming courses you have taken, and list projects and activities where you have used these skills. If you have acquired some of this knowledge by self-study, then you may ask one or more of the people who write reference letters for you to comment on it. Depending on your work experience and the length of time since graduation, we will accept letters of recommendation from employers or colleagues as substitutes for one or more of your three academic letters of recommendation. If you have previous work experience related to finance, then please make sure to mention it on your resume. It is a valuable part of your background for purposes of admission to the MAFN program. The MAFN Program requires GRE (general) scores or GMAT scores. GRE scores are preferred. GRE subject test scores are not required. Potential applicants often ask what level of GRE or GMAT scores is expected. Please understand that test scores is not the only thing that counts. 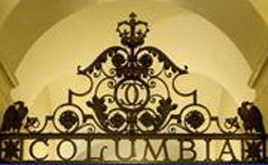 All aspects of an application are important, including recommendation letters, work experience, relevant knowledge, skills and accomplishments, courses taken, grades, evidence of diligence, motivation, and creativity, and evidence of the ability to succeed at Columbia University and in the global world of finance. For information about the test scores of current students, see the page Admissions Statistics.